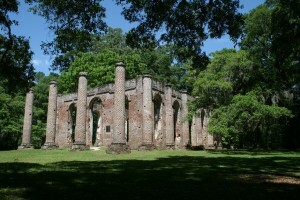 Perhaps the most well-known ruin in the Palmetto State, Old Sheldon Church is a historic site located in northern Beaufort County, a few miles north of Beaufort in the Sheldon area. Known also as the Sheldon Church or Old Sheldon Church, the pre-existing building was originally known as Prince William’s Parish Church. The church was built in the Greek Revival style between 1745 and 1753. Prince William’s was burned by the British in 1779 during the Revolutionary War. In 1826 it was rebuilt and later burnt by William Tecumseh Sherman, in 1865, as told by signs at the site.